Scientific American's March issue has an intriguing article which explores the efforts of digital activists to circumvent corporate and governmental control over the Internet. The aim of the moment is to configure and build a decentralized mesh network that cannot be blocked, filtered or turned off. 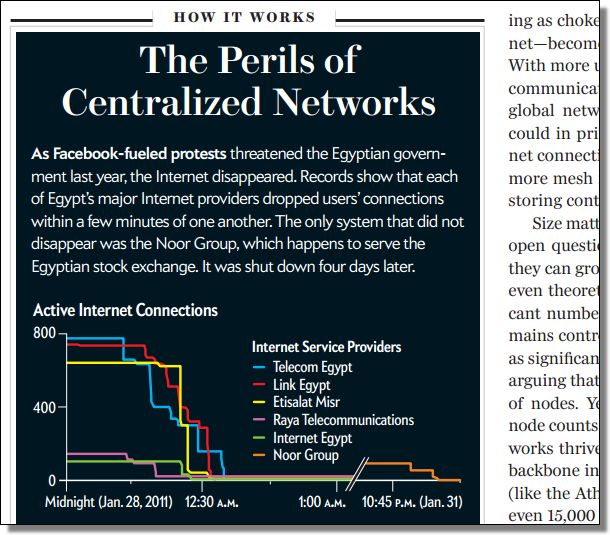 Egypt's Internet shutdown during last year's Arab Spring played a significant inspirational role. With a "shadow" network configured, activists would remain able to communicate, even after central hubs have gone dark. Another fascinating addition to all of this is Scientific American's Science Talk podcast: The Coming Entanglement [MP3]. In the podcast, SA editor Fred Guterl talks with Bill Joy and Danny Hillis about the need to build an alternative, hardier network due to the ever increasing complexity of our current Internet (which makes it ever more prone to unexplained failures). 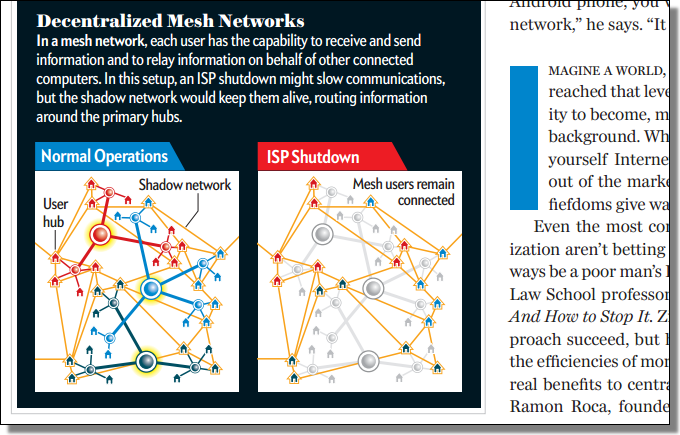 Joy and Hillis envision a simpler, more robust network as a way to shelter some of our critical infrastructure from entanglements.